The guarantee for elements manufactured by the ZPAS Group is 5 years. Post-guarantee service is provided without a time limit. SJB 10U SERVER RACK SET- PERFECT FOR OFFICE. Designed for IT professionals to securely store equipment such as hubs, routers and patch panel, excelent for your office. Dimensions (H x W x D): 515x600x600 mm. Material: Sheet steel, Safety glass, MDF-board 18mm. Surface finish: powder painting in colour GREY RAL7035, desktop'Calvados. Stable, welded construction - will secure your equipment. Glass door - enables easy monitoring of installed equipment. Elegant desktop made of furniture plate - makes your office more stylish. You can also use it as a place for other equipment. 2 pairs of 19 mounting angles - perfect for networking, small servers, Audio-Video and CCTV installations. Removable rear shield - for comfortable access. Knock-out blanking plate in the bottom and additional brush - you can easily lead out cables. 4 leveling feet - suitable for any type of floor. To improve airflow and allow to install roof fan. Makes your cabinet more movable. Make sure, you equipment is well secured. 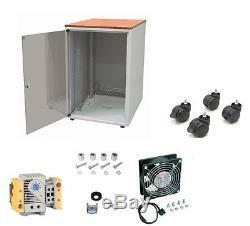 The item "SJB 10U 600x600 19 SERVER RACK IT CABINET WITH FAN KIT & CASTORS & THERMOSTAT" is in sale since Thursday, January 17, 2013. This item is in the category "Computers/Tablets & Networking\Enterprise Networking, Servers\Racks, Chassis & Patch Panels\Rackmount Cabinets & Frames".group" and is located in Welwyn Garden City. This item can be shipped to United Kingdom, Ireland.